SKU: DB70532. Categories: Sports & Recreation, Baseball. Tags: Astros, baseball, Cooperstown, Craig Biggio, Houston, Jeff Bagwell. Fifty years went by before The Houston Astros had a Hall of Fame inductee. Then Craig Biggio became their first. Two years later Jeff Bagwell emerged as another inductee. Biggio and Bagwell are arguably the two most influential and memorable players in Astro history. When they showed up in the last 1980s, the team entered its “Golden Age.” Biggio and Bawell were National League All-Stars who own most of the club’s hitting records. They helped lead the team to their first ever, and only, World Series game. Both spent their entire careers with the team and had amazing batting statistics that would make them memorable on any team. To the Houston Astros, though, they weren’t just memorable, they were part of the Killer B’s, a group of players that all had last names beginning with B that helped make the Astros famous in Texas. 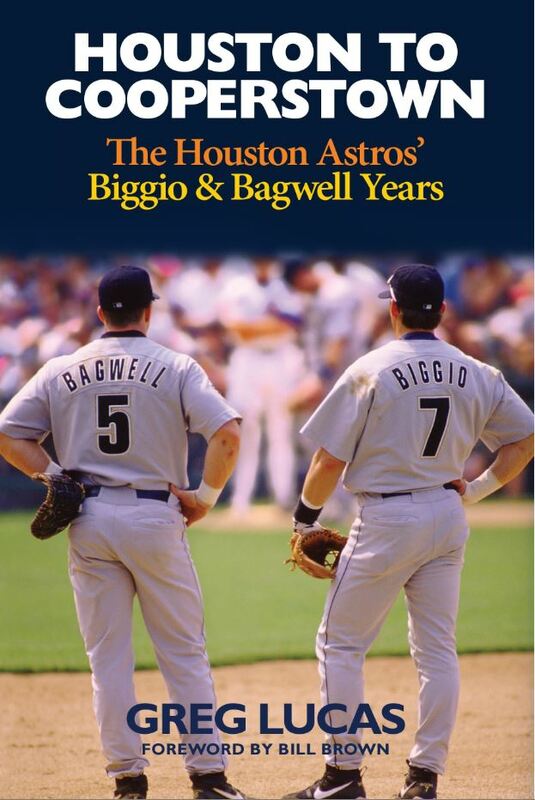 In Houston to Cooperstown: The Houston Astros’ Biggio & Bagwell Years, the author explores both Biggio and Bagwell’s legacies with stories from the stands, teammates, his own announcing days, and the players themselves. The book chronicles the two men as they traveled with the team and made Houston history. For over 45 years Greg Lucas has been a sportscaster and play by play announcer heavily involved in Major League Baseball and the National Basketball Association with the Texas Rangers, Houston Astros, Houston Rockets, San Antonio Spurs and Indiana Pacers. He has called over 4000 sporting events including major college football, basketball, baseball plus his work with the pros and a total of 25 different sports. His first book, Baseball-Its More Than Just a Game was based on materials he had collected and used in broadcasts and telecasts and as part of pre-game and other special programs over his long active career. A native Midwesterner from Kokomo, Indiana, Greg got his career started while getting his undergraduate degree from Butler University in Indianapolis.